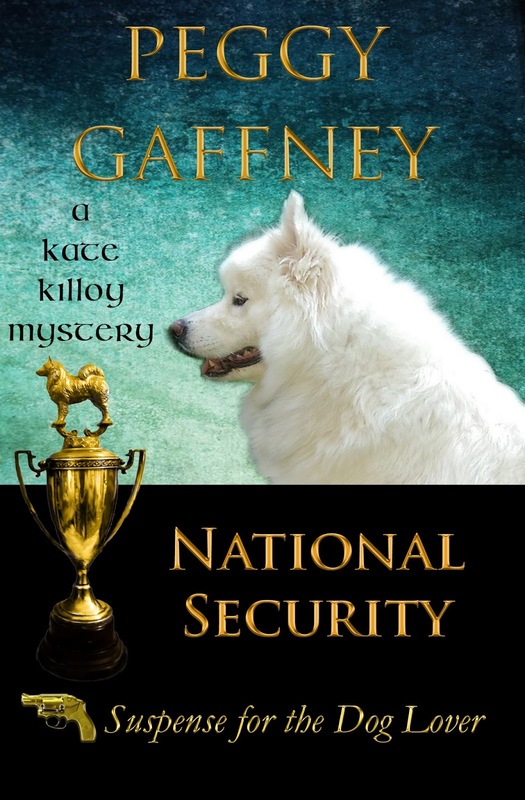 Peggy Gaffney is the author of the Kate Killoy Mysteries of Suspense for the Dog Lover, which have been described as Die Hard meets Best in Show. Today she offers us a short story from the series. Learn more about Peggy and her books at her website. Kate had been fighting months of grief since the deaths of her father and grandfather. However, she had woken that morning, realized it was Christmas Eve and suddenly found herself resolved to get into the holiday spirit. This would be her first Christmas in her little house next to her kennel. She’d be going to her mother’s for Christmas dinner, but she suddenly wanted to bring the spirit of the holiday into her new home. Getting a tree wasn’t a problem. When you own fourteen wooded acres, what you do is grab a hatchet and crosscut saw, ropes, a dog-sled and a dog. 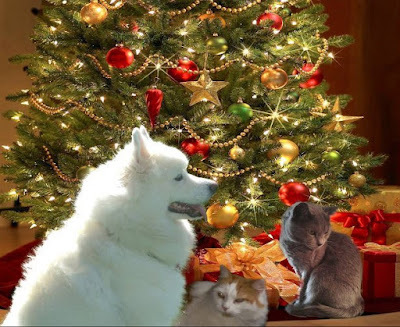 Though most of the Samoyeds in her kennel were trained for the show ring, Dillon had also been training on a sled team for more than a year and would be the best answer to getting the tree home. She found the perfect tree after just half an hour of looking. The cutting and loading went quickly. Dillon thought this was great since there was nothing he enjoyed more in winter than racing through the snowy wooded trails pulling a sled. Back in her cottage, she realized that some of her younger Sammy helpers needed to learn the difference between outdoor and indoor trees. She made a quick save with a fast grab for two male puppies and tucking each under an arm, called the adult dogs to follow, and sent them all out into the yard to kept the tree from being marked. Back at work, she pulled the lights her grandmother had given her from the bin. As she set about untangling the string, she thought she saw movement. A glance around the room showed nothing. Attaching the beginning of the strand to the top of the tree, she caught a movement and saw the other end moving silently across the floor and disappearing. Going hand over hand, she followed the strand and gazed into the darkness behind the sofa. Tugging on her end she felt a quick tug in the other direction, and two golden eyes stared out at her. Her ‘invisible’ Chartreux cat, Macbeth, was using her charcoal-gray/blue coloring to hide her theft in the semi-dark room. Laughing, she reeled in the strand, grabbed the cat and after a snuggle, put her on the sofa and finished adding the light to the tree. She turned on the radio and set it to the station playing Christmas music and hummed as she reached for the blue box of ornaments. Its contents moved and the angel which would be placed on tree-top, jumped from the box and started moving unsteadily across the room. Kate reached for the ponytail dangling from the angel’s hair and lifting, saw white fuzzy feet sticking out the bottom. Suddenly her white and marmalade kitten popped out of the bottom. She scooped her up, put her onto the overstuffed chair by the fireplace and prayed both her helpers would stay put. Amazingly, they did but were quite vocal in their meowing critiques as the rest of the decorating came together. After she finished putting on the last ornament, she went into her bedroom and gathered up armloads of wrapped packages and arranged them around the tree. Then, opening the door to the yard, she invited her ‘helpers’ together as she plugged in the lights. She let the cats explore the boxes as the dogs settled in to watch the sparkling lights highlight each ornament, and for the first time in many months, Kate felt a quiet peace settle over her. In fact, she could swear she felt her father and grandfather’s comforting hands resting on her shoulders just as they always had done when she was going into the ring to show her dogs. She looked at the dogs and cats around her and let their comfort lift the grief from her heart and replace it with the joy of the season. 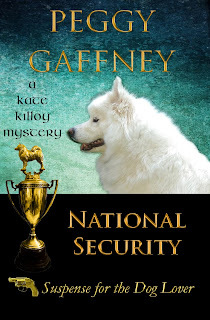 The third book in the Kate Killoy Mystery series of Suspense for the Dog Lover, begins when Kate and her fiancé Harry Foyle, a former geek for the FBI, prepare to leave with Kate’s Samoyed dogs for the National where they and hundreds of others will compete for best. Kate gets a card from a friend saying she’ll meet her at the show to share something secret and vital. On the way to the show, they find out her friend has been murdered. Kate is determined to find her friend’s killer, but the NSA and the FBI are more interested in the secret they are sure has been given to Kate. They don’t believe her when she says she didn’t get anything from her friend that was important to national security. The agents tend to doubt her, even more, when someone tries to kill her at every opportunity. While Harry and her friends are trying to keep her alive, Kate’s determined to solve the puzzle of the vital secret. Kate recruits a former Russian spy to help. So between trips into the ring to compete in agility, obedience, and breed classes with her dogs, and dodging bullets, Kate and Harry must figure out who is behind a plot to destroy America and stop them. Though terrified and exhausted, Kate is determined to do her best in the ring–to win. Thanks, Peggy, for sharing your short. Love the photo. Happy Holidays and best wishes for the new year! Angela, glad you enjoyed the story. Have a very Happy Holiday.